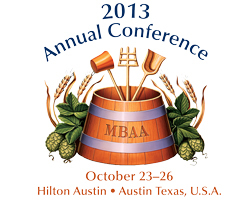 Gain access to the best research from the 2013 MBAA Annual Conference! The Online Proceedings include over 80 presentations from the meeting held in Austin, Texas, October 23-26, 2013. Oral presentations include the author’s full slide show complete with graphics, and posters can be magnified to focus on specific figures, images, tables, and graphs. Interested in the recorded presentations? Not an MBAA member? Join MBAA first, then you receive the 2013 proceedings at no charge. Presenter: Graham G. Stewart, GGStewart Associates, Cardiff, U.K.
O-40. Direct oxidation of amino acids—An unrevealed pathway leading to the formation of staling aldehydes in bottled beer? O-41. Are U.S. brewers ready for beer membrane filtration (BMF)? Presenter: Javier Gomez-Lopez, FlavorActiV, Henley-On- Thames, U.K.
Coauthors: Richard Boughton and Marie Pohler, FlavorActiV, Henley-On-Thames, U.K.
Principles and application of HACCP in a brewery Presenter: Rob Fraser, Sierra Nevada Brewing Co.
MBAA food safety program Presenter: Jim Kuhr, Matt Brewing Co.